What is the church, and what is essential to it particularly in a post-Christian age? 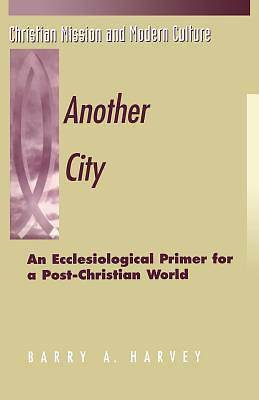 In contrast to "the City," that is, the world (including the hedonism and narcissism of popular culture) that virtually all human beings now inhabit, the author calls upon the church to remember that it is "Another City" that does not compromise itself by giving allegiance to any political entity that belongs to this world. He points out how the hedonism and narcissism of "the City" or popular culture have been embraced also by those who make up Christ's body, the church, without seeing that this contradicts biblical faith. In contrast, the early Christians represented a subversive presence or "Another City" within the wider Roman society. In time, however, the church succumbed to "the City, became aligned with the empire, gained power, and began to render to Caesar what belonged to God." Today what was once called "Christendom" is rapidly eroding. Christianity no longer dominates as in the past. In such a situation, Harvey says, it is time for the church to remember that it is "Another City" and that it does not compromise itself by giving allegiance to any political entity that belongs to this world. Instead, the church has the courage to live, like Israel of old, in the diaspora as a distinct minority, remaining an uncompromising and faithful servant of God's final (though still future) triumph in the risen Christ. Barry A. Harvey teaches systematic theology at Baylor University.